Edition 2 / 500 copies (250 US, 250 UK). Includes A4 insert on glossy paper. The album was recorded in two days at Samhain 1998ev under the level of the River Thames in the Ancient Borough of Southwark. how does this black press sound? Anyone still looking for a copy, it is now available on Amoeba.com (as of 02/12/2017) for $28. Free US shipping. EDIT: Looks like it is gone now, but the translucent yellow (ltd to 1000) was still available on Pebble today, too. 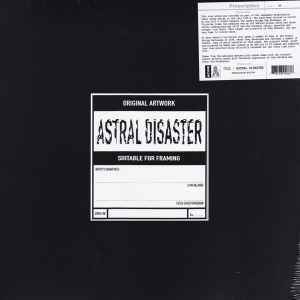 So I missed the first repress of 500 and I just received a black vinyl repress of Astral Disaster today from Pebble that was supposed to be part of the second run of 250 but it says "Edition 2/500 copies". Did they increase the second run to 500 so there are 1000 black copies of the 2016 reissue in total, or did I somehow get part of the 500 copy first run of the repress? Ironically I also received the black/silver Spiral Insana today as well. Just listened to the copy I purchased here, having given up on pre-orders, from a seller in France. I remember that the CD I've listened to all these years was not identical to the original Prescription release, duplicated here, but it is quite different. Less electronic ambience, kicking right off with the sea priestess and a bluesy sitar is the most prominent instrument. I didnt' realize that I'd now have two very different (I wouldn't call the differences slight) manifestations of Astral Disaster. At the moment, I prefer the version I'm familiar with, but having had this for one day, I don't want to leap into and get stuck on any conclusions for some time to come. Besides, here's A, and here's B, and why even play the comparison and which is better game. This is off topic here, but I received it on the same day, and all of these people were friends... I also got the new double album release of Spiral Insana by Nurse with Wound. It sounds spectacular. It's like hearing it for the first time, and I'm almost sure there are changes, but maybe it's really true that one hears more on vinyl. It was number 454 (I thinK of the limited 500 release with silver and black vinyl. Most Delicious and dated not one bit. Pebble Records is a reliable source for this and they just shipped me a black one for $36. DDD cancelled my order at $25 due to no available stock. Any sign of the second pressing that was to hit the street on December 30th? I was lucky too.Got my copy from Norman Records.Now it's out of stock everywhere.. This is a bit different release than cd - version. (LOCI CD14).. forexample The Sea Priestess is totally different. But still one of my favorite Coil albums. The number of people who bought it just to sell it back for profit just disgust me. Capitalists pigs.